On Monday, 5 July, No. 19 Spitfire Squadron in Duxford took off for air firing training. The exercise area was Sutton Bridge, a flat piece of Lincolnshire spreading 16 feet below sea level, which served as RAF gunnery training camp since 1926. The exercise was arranged according to skill level of the pilots. The experienced ones were to fire at sleeve target towed behind an aircraft, whilst new pilots were briefed for firing at ground target. Firing exercises were frequent these days, and there would be nothing unusual about that day in squadron’s records book if it wasn’t for the fact that three of their Spitfires carried entirely new armament – a pair of 20 mm cannon instead of the usual machine guns. The Spitfire and the Hurricane were originally armed with eight .303″ Browning machine guns, each with 300 rounds. When devised back in 1934, this was a revolutionarily heavy armament, based on an idea that in view of the increasing speeds of combat aircraft, gun firing opportunities for a fighter would be brief, so large concentration of fire was required to retain the chance of bringing down the opposing aircraft. Six years on in 1940, while still impressive, the eight-gun armament was beginning to show its limitations; the battery of machine guns turned less devastating than initially expected. One inescapable problem was the bullet size; the small bullets fired by the Browning guns could not penetrate the newest, heavier armour being introduced on German aircraft, and they could carry only tiny amounts of incendiary or explosive to assist their task. Another reason was the RAF’s standard instruction to spread the cone of fire, harmonising the guns for a long range of 365m. While this increased the probability of hitting the target at all, it also considerably reduced the effectiveness of the fire if aimed at a certain point from short range. Unfortunately, as Malan, Stanford-Tuck and other leading RAF pilots learned in their earlier engagements with the Luftwaffe, hitting hard at close range was the order of the day. Eight-gun armament is evident in this forward view of a Spitfire Mk. I. At the time of its introduction, it was the heaviest fighter armament in the world. Cannon-armed aircraft was an obvious next step, and the idea of installing this comparatively heavy weapon on a fighter was pursued among leading aviation nations since mid-1930s. Besides the construction of a weapon itself, there were immense technical issues coupled with its installation in a light structure of an aircraft: cannon were heavy, had powerful recoil and required much more space for the ammunition. The Germans had some initial success with their Heinkel He 112 V6 prototype, nicknamed Kanonenvogel and armed with a sole engine-mounted 20mm canon, which was tried operationally in Spain, but proved truly successful only in the ground attack role. The French had been developing their own engine-mounted cannon Hispano-Suiza HS.404, which was employed in their principal fighters – Bloch MB.152, Morane-Saulnier M.S.406 and Dewoitine D.520. The HS.404 attracted also British attention, and it was selected in the late 1930s for license production – to equip the forthcoming Westland Whirlwind twin-engined fighter. By design, the French cannon was suitable for engine or fuselage installation. No wing installation was ever attempted by Hispano-Suiza who thought the idea to be impracticable. However, the design of the Rolls-Royce Merlin did not support engine-mounted cannon and so the wing installation had to be tried if the cannon was to be employed in single-engined RAF fighters. Spitfire was selected as a trial type, with first two prototypes ready for in April 1939 and January 1940 respectively. The pace of progress was slow, not least due to the availability of the new weapons – there were immense problems in setting up production, which meant that only a strictly limited number of cannon were available, and those that were in need of further refinement. Meanwhile, in May 1940 the improved cannon-equipped Messerschmitt Bf 109E-4 entered service with the Luftwaffe, armed with modified MG-FF Oerlikon cannon and two machine guns. The MG-FF was adapted to fire the new Minengeschoss ammunition which had very thin walls and a doubled capacity for high explosive or incendiary load. The theory was that solid bullets relied on hitting the relatively small vital areas to have an effect, whereas an exploding shell could cause serious damage regardless of where it struck. There is no doubt that this theory was correct: compared with the hitherto used Bf 109E-3 which carried only four machine guns, the armament of new Bf 109 was vastly superior. Additionally, the German heavy fighter, the double-engined Bf 110, carried a complement of two cannon and four forward-firing machine guns. In this situation Lord Beaverbrook stepped in, embracing the idea of the cannon Spitfire. Having learned about the projected benefits of the new armament, he authorized in his usual impetuous manner that to speed up the introduction of new weapon, further trials were to be conducted directly by an operational squadron. To that end, 30 Spitfire wing sets were to be converted to accept sixty Hispano cannon, with utmost priority. All this was by no means apparent to the pilots of No. 19 Squadron, who received their first three cannon-armed Spitfires of the Beaverbrook “lot” – R6261, R6770 and R6776 – on 1 July 1940. A briefing of flying personnel was held that day. Pilots were duly informed that they were the first unit to try the new aircraft, and that more cannon aircraft were to arrive shortly. A trial period was required to assess the suitability of cannon armament and develop tactics for their use. 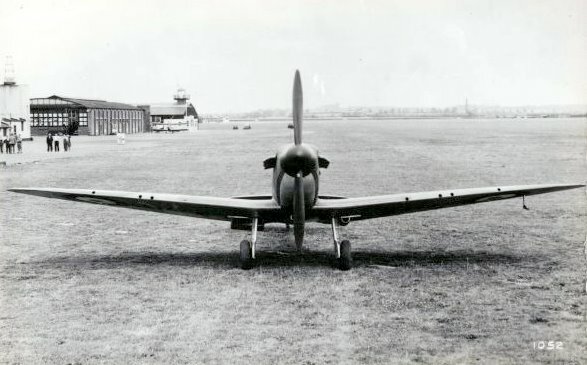 One aircraft had been previously tried in operational condition by the auxiliaries in Scotland, with some success, but there were technical problems to be ironed out. Further in the briefing, Commanding Officer Sqn/Ldr. P C Pinkham gave a lecture on merits and demerits of cannon-equipped Spitfires. Speaking of advantages, he highlighted the “terrific destructive power” of cannon when compared to machine gun. Range of effective fire increased. Accuracy was markedly better, and higher muzzle velocity meant easier deflection shooting, because the amount of necessary deflection would be decreased. There were also disadvantages. Each cannon carried only 60 rounds, which meant that fire period was restricted to a mere six seconds. There was risk of expending everything on the first engagement, making the fighter defenseless against other enemy aircraft. There was no other armament; all guns of the cannon Spitfires were removed to compensate for the increased weight of the Hispanos. Under disadvantages, Pinkham pointed the lack of “spread” of fire (sic). Finally, he went to the main problem discovered in previous trials and still presumed to prevail: gun stoppages. These were still frequent, and stoppage of one cannon made it very difficult to keep a steady aim with the other, as the asymmetrical recoil veered the aircraft off its course. Concluding, the CO said that it was evident that new attacks would have to be developed to cope with the disadvantages and to make full use of the advantages of the new armament. Trials were to commence immediately. On 4 July, training flights were carried out in the morning. New attack technique devised by the CO was as follows: section of two aircraft dived from 2,000 feet above and to side of three target aircraft, levelling out dead astern, closing rapidly and gaining a steady non-deflection sight. Cannon fired in short burst, then break-away carried out downwards and to the side. The attack was then renewed from above and to the side again. The two flights continued these practices throughout the day. Interestingly, Pinkham’s new attack was based on a section of two aircraft in line astern instead of the usual three. The pilots immediately found the new combat formation highly manoeuvrable. Experience was reported to the Group, which has taken great interest and informed that other Squadrons were also trying it out. The next day over Sutton Bridge, the cannon were to be fired for the first time. The experience was bitterly disappointing. Gun stoppages feared previously were all too evident; most pilots were able to fire only a few rounds before one or both cannon silenced. For a day’s exercise only one cannon shot punctured the target! The cannon-armed Spitfire Mk. I was never entirely successful. Only the introduction of an improved and more powerful Spitfire Mk. V in 1941 would set the new standard for the Spitfire armament, but that was still far ahead. On the evening after the first firing exercise, the weather was closing down, with low clouds hanging over the rolling hills surrounding Duxford aerodrome. That night, there was a well-attended cinema show in the station theatre. What a remarkable story. One could almost say “thrilling”. There are so many people still infatuated by the Spitfire and others williong to buy those remaining for huge sums it is a wonder to me that Vickers does not start making a few of them again just for sale as a profit making venture. 200 or 300 would readily sell if I read the market correctly. There are two flying Spitfires in Australia right now (2014) both owned by the same man who comes from a very wealthy family. When they appear at air shows many people come just to see the Spifire. When its done its stuff you see many people leave to go home. All they were interested in was the Spitty. The ex WW2 planes cannot go on forever. The engines can be rejuvenated but the air frames I think have a terminal life but while they last they provide a thrill for me that I find difficult to describe. They always have and I am 80 this year. I’m a retired USAF foreign language specialist. I never got much face time with aircraft of any type or country, though I did get a lot of “ear” time. I’ve always been an RAF fan, especially considering their Battle of Britain efforts. In that regard, across the span of piston aircraft available for the UK and the US, the Spitfire was/is overwhelmingly my favorite aircraft of the period – which means I exclude my own country’s wonderful fighters. I’m hoping that someone, similar to the group who have remade the Me-262, will step up and produce at least a limited number of new ones.